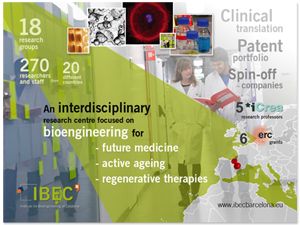 The Institute for Bioengineering of Catalonia (IBEC) conducts excellent interdisciplinary research at the frontiers of engineering and life sciences in order to generate new knowledge by putting together fields like nanomedicine, biophysics, biotechnology, tissue engineering and the applications of health information technology. At IBEC, we recognize that a friendly, supportive environment and strong bonding among colleagues is essential for producing confident, open-minded research. To help our young scientists get the head start, regular social and networking events are organized within the institute or by its hosting campus, the Parc Científic de Barcelona (PCB). IBEC’s PhD Student Committee was set up in 2013 to enable students to have a voice in the running of the institute and to organize events of their own. Having begun with Bowling Fridays and other networking and social events, the committee has branched out into organizing and co-organizing courses and workshops. In addition, the committee also carried out a satisfaction survey to monitor morale among PhD students at the institute and identify common problems or issues. Since IBEC PhD students are registered at a university, they receive an identity card and they are able to benefit from all the usual discounts available to students in Barcelona and beyond. For instance, IBEC has football clubs, running teams, as well as a mailing list for social announcements, that help the IBEC community to get to know each other and welcome newcomers. In the PhD Student Committee, we are constantly in touch with several departments at IBEC (Human Resources, direction, communications, etc.) to improve researchers’ everyday life at IBEC. We collect the concerns of researchers regarding working conditions’ matters, and we work on trying to improve them by communicating with the required department. We collaborate with administration in finding and organizing workshops, trying to meet the interests and requirements of researchers. We organize social events to facilitate networking among researchers. We are a non-profit reference group for PhD students in IBEC. We try to help with academic issues, from administrative transactions to trying to connect people to solve more technical or experimental issues. The PhD Student Committee organizes both social and scientific events to promote networking among scientists. In this section, you will find details of organised events. Find the latest events organized by the committee in the IBEC calendar under the tag Social / Internal / PhD Committee (pink). This section aims to offer both academic and non-academic resources and links of interest (administrative transaction, information about PhD programs, useful information for newcomers to IBEC and to Barcelona, etc.) for the IBEC PhD student Community. Since it is a dynamic section, constantly renewing, everyone is free to suggest ideas about content that might be of interest for the whole IBEC PhD student community. PhD programmes related to IBEC’s groups. 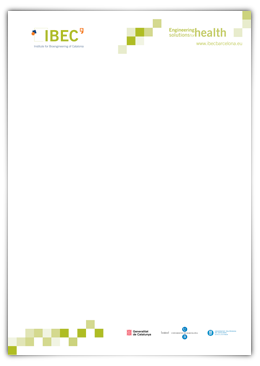 Template for A0-size scientific poster for conferences. (For use in Powerpoint). If you’d like to get involved in the committee or get in touch with us, please send an e-mail to phdcommittee@ibecbarcelona.eu. Follow the IBEC PhD Student Committee on Facebook!